Seminal to the Pictures Generation as well as contemporary photography and performance art, Cindy Sherman is a powerhouse art practitioner. Wily and beguiling, Sherman's signature mode of art making involves transforming herself into a litany of characters, historical and fictional, that cross the lines of gender and culture. 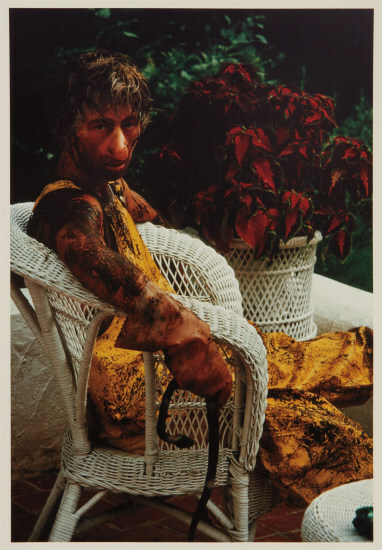 She startled contemporary art when, in 1977, she published a series of untitled film stills. Through mise-en-scène​ and movie-like make-up and costume, Sherman treats each photograph as a portrait, though never one of herself. She embodies her characters even if only for the image itself. Presenting subversion through mimicry, against tableaus of mass media and image-based messages of pop culture, Sherman takes on both art history and the art world. Though a shape-shifter, Sherman has become an art world celebrity in her own right. The subject of solo retrospectives across the world, including a blockbuster showing at the Museum of Modern Art, New York, and a frequent exhibitor at the Venice Biennale among other biennials, Sherman holds an inextricable place in contemporary art history. Signed, dated and numbered 51/125 in black ball-point pen on the reverse, framed. This lot is no longer available.